Coordinate Geometry is also called analytical geometry. In algebra, coordinate system, plotting pairs, and graphic lines were introduced to you. However, these tools are used in geometry. As a result, Algebra and Geometry are used hand-in-hand to solve many math problem, related to real-world. Coordinate geometry came into existence in 1637 AD when a French mathematician, Rene DescartesÂ realized that a straight line or a curve in a plane can be represented by algebraic equation. In fact, points, lines, line, segments, rays as well as geometric shapes can be represented on a coordinate plane too. In coordinate geometry, you can represent a point on a plane by an ordered pair of real numbers, which are called coordinates of the point. Let us draw some columns and rows as indicated in the above figure. We name the columns as A, B, C, D and the rows as 1, 2, 3, 4. 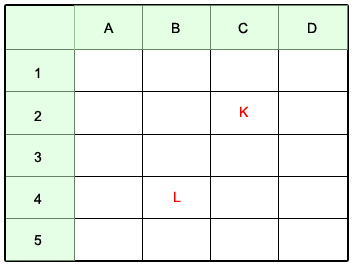 Now, in order to indicate the position of the point K, we can refer it as C2 where C is the column and 2 is the row number. Similarly, point L can be defined as B4. Remember, B and 4 are called coordinates which always has two parts the row and the column. A straight line can be represented in coordinate geometry by means of algebraic equation with real coefficients. 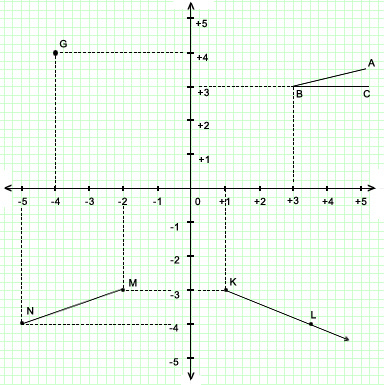 Points are placed on the coordinate plane in coordinate geometry. Values to the right are regarded as positive and values to the left are regarded as negative in case of x-axis. In the y-axis, values, above the origin and below the origin are regarded as positive and negative, respectively. A point is located on a plane by two numbers. One gives its location on the x-axis and another locates it on the y-axis. You will find it easier if you see the point K on the plane and its’ location is 4 on the x-axis and 3 on the y-axis. 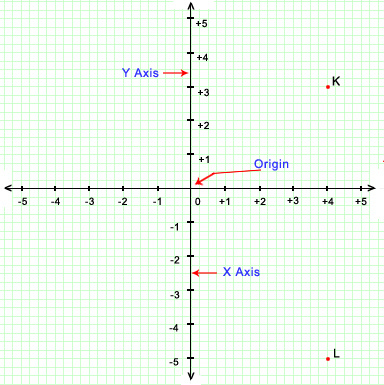 Similarly, point L is located on 4 on the X axis and point -5 on the Y axis. These are also called rectangular coordinates. 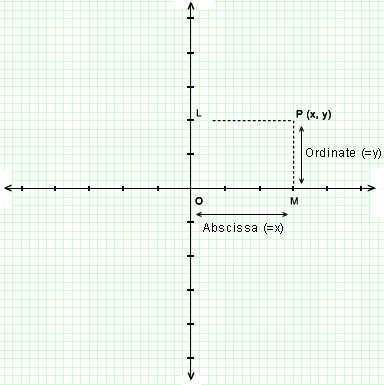 If you take a point P and draw two perpendiculars PL and PM on y-axis and x-axis respectively, then the length LP which is equal to OM is called the x-coordinate or the abscissa of point P and MP is called the y-coordinate or the coordinate of point P. The point whose abscissa is x and ordinate is y is named as point (x,y) or P(x,y). However, the points x and y are different that is, x is not equal to y. The two lines X’OX and Y’OY divide the plane into four parts, which are known as quadrants and the XOY, YOX’, X’OY’ and Y’OX are called first, second, third and fourth quadrants respectively. If you’re feeling ready, try out Coordinate Geometry Test.